The global market for corporate heritage data management solutions is experiencing significant growth in demand from a number of industry verticals. Demand for essential historical/heritage in an organized manner is the driving force of the market. Companies have started realizing the benefits of heritage data for marketing and brand development activities. Increased spending on marketing and related activities is anticipated to drive the corporate heritage data management market. Transparency Market Research estimates that the global corporate heritage data management market will rise to a valuation of US$834.6 mn by 2024, from US$175.2 mn in 2015. The market is estimated to expand at a remarkable CAGR of 19.1% during the forecast period from 2016 to 2024. Among the solutions used for corporate heritage data management, digital asset management (DAM) held the largest market share of approximately 66% in 2015, as digital asset management provides an all-inclusive system for achieving corporate heritage data management. It provides a logical hierarchy for all the digital data within the enterprise. Data can be organized according to various parameters which can be manually selected. Furthermore, digital asset management provides advanced security features such as authorized permissions to data and features. It helps in limiting the exposure of intellectual property owned by enterprises. Full lifecycle support helps in moving the content within different applications and manage the workflow. The segment of digital asset management is expected to retain its dominance in the global corporate heritage data management market throughout the forecast period as well, and account for a nearly 67% of the global market by 2024. The segment of data collection management (DCM) solutions holds a much lesser share in the global market as compared to the segment of DAM solutions, however, both the segments are anticipated to experience similar growth during the forecast period. In 2015, North America was the dominant market for corporate heritage data management as demand across the retail and manufacturing sectors experienced high adoption of sophisticated heritage data management solutions for effective organization of historic data. The use of heritage data management solutions across automobile companies for using historic data such as profiles of old models and manufacturing facilities also substantially increased in the region in the past few years. The continuous rise in demand for advanced heritage data management solutions across numerous industries is expected to allow North America to retain its dominance in the global market in the next few years as well. However, due to the growing needs from the media and entertainment and telecom and IT sectors, Asia Pacific is anticipated to outpace North America and Europe, the latter of which presently holds the second position in the global market, over the forecast period. The region is expected to exhibit a CAGR of 21.3% from 2016 through 2024. The Asia Pacific heritage data management market is expected to gain tremendous growth opportunities from the flourishing telecom and IT sectors. The market presently features a rather small number of established vendors. As such, the competition is moderate. However, the high growth prospects of the market are expected to attract many new vendors, making the market more competitive. Some of the key players operating in the corporate heritage data management market are North Plains Systems Corp., Open Text Corporation, Widen Enterprises, Inc., NetXposure, Inc., MediaBeacon, Inc., Eloquent Systems, Inc., CultureArk, GruppoMeta, Extensis, Inc., Arkivum Ltd., Media Equation Pty Ltd., Heritage Werks, Inc. and FINNZ. The global corporate heritage data management market is envisaged to testify the presence of a large count of small and medium-sized enterprises (SMEs) due to easy market entry facilitated by the growing prominence of various solutions. Increased product differentiation and the advent of novel solutions could augment the demand for corporate heritage data management in the coming years. The rising awareness about the advantages of using corporate heritage data management for brand development and marketing activities is foreseen to considerably increase market demand. 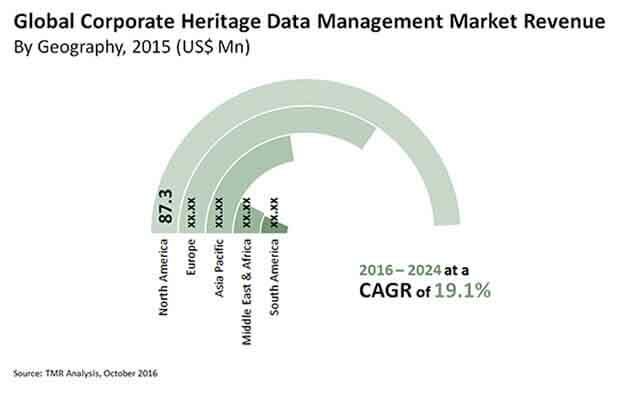 The global corporate heritage data management market could be segmented as per application and solution, where the digital asset management segment by solution is predicted to rank further in terms of share. The report offers a distinctive evaluation of the global corporate heritage data management market, taking into account its growth factors, restraints, and potential business prospects. The world corporate heritage data management market is prognosticated to embrace a significant demand due to the rising need across corporate companies to protect their business-critical data. Companies increasingly use corporate heritage data management solutions for the purpose of efficiently organizing their vital business data in a shareable and an effortlessly accessible manner. Even historical data of companies could be protected with the right implementation of corporate heritage data management solutions. Advanced security solutions offered by corporate heritage data management vendors are anticipated to create more demand in the market. The easy deployment of corporate heritage data management offerings using cloud-based solutions is predicted to set the tone for a significant growth in the market due to increased demand. The development of the world corporate heritage data management market could be positively impacted by the easy and economical implementation of the offerings. In this regard, the future growth prospects of the market could gain support as cloud-based solutions continue to stand out. The international corporate heritage data management market is prophesied to crown North America as a leading region considering its dominance in the recent past. Forward-looking corporate heritage data management solutions witnessed a high adoption in the region due to the need to effectively organize historic data. Furthermore, the demand in manufacturing and retail industries is expected to add to the growth of the market in the region. The automobile industry could also contribute to the regional growth on account of the high use of historic data related to profiles of manufacturing facilities and old models. While Europe could secure the second position in the international corporate heritage data management market, Asia Pacific is prognosticated to exhibit an outpaced performance in the coming years. This could be because of the rising demand from the telecom and IT and media and entertainment industries. South America and the Middle East and Africa are projected to be other important regions of the market but with a relatively slower growth. The worldwide corporate heritage data management market includes top-ranking companies such as MediaBeacon, Inc., NetXposure, Inc., Widen Enterprises, Inc., Open Text Corporation, and North Plains Systems Corp. More of such prominent players operating in the market are analyzed in the report, considering their products and services, latest offerings, recent developments, market shares, and other crucial aspects.